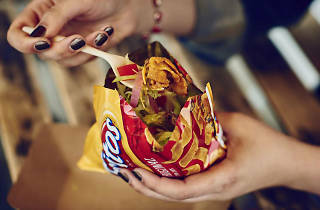 Photograph: Courtesy HomeState We could go for a Frito Pie from HomeState right about now. Texans living in L.A. can find sweet Tex-Mex relief at HomeState, where the queso flows freely and the breakfast taco selection is tops. When it comes to the breakfast tacos selection, choose either a corn or flour tortilla then opt for eggs, bacon, cheese, refried charro beans, chorizo, shredd brisket and more. There are migas, too: crispy corn strips with scrambled eggs, onions and cheese. 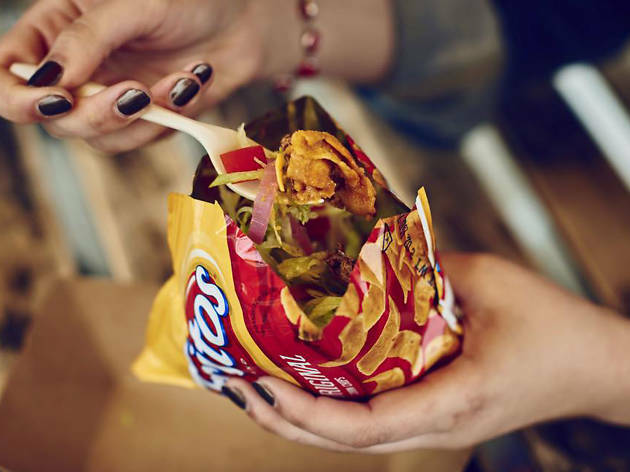 Oh, and then there's the Frito Pie in a Bag—a heartwarming (and heart attack-inducing) bag of Fritos slathered in chile con carne, black beans, lettuce, tomato and pickled veggies. A great spot to hit if you're looking for some breakfast tacos to start your day. The tortillas are something special and the coffee isn't bad either. It's pretty well priced and always seems a popular spot. Hard not to recommend. Absolutely worth the line. The house-made flour tortillas are what sets HomeState's breakfast tacos above and beyond the rest (although, surprisingly, the breakfast-taco scene is pretty sparse in Los Angeles). Get a couple tacos and a queso to share and I promise you'll be a happy camper.